« SCORPIONS AT M3 ROCK FESTIVAL 2010 – THANK YOU SCORPS!! KOPEK – Each era seems to have one, two or maybe three “new” Rock bands that illuminate with an unexpected specialness. Dublin Ireland’s Rockin’ trio named Kopek is special to my ears. It is 2010, and a whole new era of Rock ‘N’ Roll has just begun. 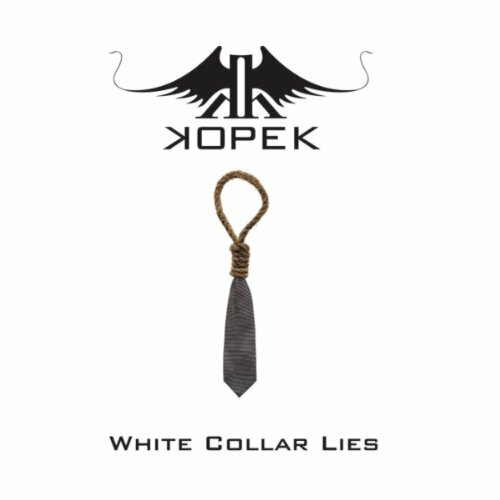 Sure, my ears may have some Rock ‘N’ Roll mileage on them, only what I hear in the music from Kopek is Modern Rock that isn’t just shunning that dreadful and uninvited guest named the “status quo”… Kopek has obliterated it with their debut album – White Collar Lies. The lyrics, song writing, musicianship and Modern Rock angst I hear on White Collar Lies, all points to the direction of Kopek one day becoming bigger than they could ever dream of being. As long as Kopek does not lose sight of keeping their music’s intentional and unintentional sound, feel and message within the parameters of soul and passion, all the while saturating it with pulsating modernism, they may very well be an iconic example of Rock influence in 2020. A momentary sigh of relief came upon me, after my very first listen through of White Collar Lies… there just isn’t any Pop accessibility happening in the music of Kopek. Thank God. Certainly, the first single from White Collar Lies, Love Is Dead, most credibly will garner enough mainstream attention without a doubt. Once anyone unfamiliar with Kopek listens to Love Is Dead, they shall forever and always know who Kopek is. A personal and emotional Mod Rock march to psyche-out madness, may very well erupt in the streets, if Love Is Dead was played loud upon a giant metropolis. That would probably be a sight to see and doesn’t sound too far fetched, especially once Love Is Dead begins it’s Rockin’ and groovy Modern takeover of your soul. If I was in charge of handing down the “first single” from White Collar Lies, it would be Cocaine Chest Pains. This opening track on Kopek’s debut not just establishes them as a refreshing and viable Mod Rock Band, this song let’s it be known that Kopek can Rock quite Hard. The song – White Collar Lies is a show stopper in and of itself. The lyrics are applaudable, with Kopek putting a spotlight of despicable shame on corporate greed and selfishness. Kopek plays music that makes me feel like I’m supposed to stand up and be counted, with a seasoned attitude of musicianship radiating from every note, from every song. It is not difficult to find myself doing a semi-headbang to the Mod Rock of Kopek. Fever is a song that makes my Metalhead soul peek out the cracks and wonder what the hell is going on. Fever should, with it’s melodic foot stomping and Hard Rock influenced edginess, be another single embraced by the whole darn world too. Floridian is the up-tempo ballad that is highlighted by it’s ability to be melodic beyond belief. Inspiring melodies and just brazenly memorable is Floridian, making for guess what? Another potential single from this ultra-dynamic debut album called White Collar Lies. The trio of Kopek play their instruments so well, it is almost too easy to succumb to, while letting my mind wander off to the lyrics, energy, spirit and mood that Kopek has created throughout White Collar Lies. In the end, the music on White Collar Lies… albeit Modern Rock dominate, still has flashes of Alternative, Rock and at times Hard Rock influences, dictating from beginning to end, that Kopek really can play like their lives depend on it. Lead vocalist Daniel Jordan may very well carry you off, into an excitingly edgy and engagingly powerful world of listening delight. There is a confident streak in Daniel’s vocals, that exhibits the strength in Kopek’s songs. Kopek laid out their path of music for my ears to journey on, little did I know of the unexpected Rock ‘N’ Roll finds I would encounter along the way while listening to White Collar Lies. Let the uniqueness of Kopek’s Mod Rock blended with Hard edged crunchiness take your ears for a much overdue surprise of Rock newness. Believe me, once you’ve listened to White Collar Lies for yourself, you might very well be thinking this band is special as well. * Just click on that groovy video box below, to watch and hear just how insanely cool the Kopek song – Love Is Dead from White Collar Lies is. Plus, this Kopek music video comes with Stone’s stamp of Rock ‘N’ Roll approval! Enjoy! * KOPEK – White Collar Lies – will have it’s U.S. release, digitally, on June 29, 2010. The physical release for White Collar Lies will be on September 14, 2010. Both digital and physical releases are on Religion Music via SIN/Sony Music Independent Network. * White Collar Lies was produced by Glenn Herlihy and mixed by Tom Lord-Alge. This entry was posted on June 28, 2010 at 12:03 am and is filed under alternative rock music, Hard Rock, hard rock albums, hard rock bands, hard rock music, heavy metal music, metal odyssey, modern rock music, Music, rock & roll, rock 'n' roll, rock music with tags album reviews, alternative rock albums 2010, alternative rock music, hard rock albums 2010, hard rock music, heavy metal music, kopek modern rock band, kopek white collar lies album review, love is dead music video, metal odyssey, modern rock bands 2010, modern rock music, modern rock songs 2010, Music, new modern rock albums, rock music, rock n' roll. You can follow any responses to this entry through the RSS 2.0 feed. You can leave a response, or trackback from your own site. Never heard of this band but I will have to check them out. BTW I stumbled on your site by chance while looking at Metal Misfits blogs, very cool site and have enjoyed reading your blog and insights on metal. This KOPEK band will be “one to watch”… this is a great album. Great read! These guys are going to be BIG TIME! Love the music!!!!! Thanks for visiting Gail. You know, KOPEK just gives off that “vibe” that makes me feel like they are gonna be BIG TIME too. This is a great, well deserved review! I’m going to have to go buy the album today on iTunes because I get the vibe these guys are going to make it huge over here in the US. VERY rock, VERY real. I was fortunate to buy the album before its release at a concert where Kopek opened for Hinder. These guys are here to stay, I was impressed when meeting with them after the show as to how deeply rooted these guys are. The words they sing are not only words but trully a passion in their minds! These guys shocked us in concert, they were tight, and the show was one of the best I have seen in a long long time! Keep rockin’ Kopek, I will keep bringing people to see you and buy your albums! They are an up and coming east coast band – lots of style, great musicians, a somewhat different style incorporated into each song… Just good stuff you won’t get tired of! Just saw them the other night in Hartford CT. I went to see Cold, who i have listened to for years. There were several other bands including Cold but none of them compared to Kopek, whom i had never heard before attending this concert. This band is musically tight and very diverse. I immediately bought the album the next day and was blown away. I would definately pay to see them again. This band is refreshing and i believe they will be big someday in the near future. I second your praise for KOPEK! I saw them at the Crocodile Rock Cafe in Allentown, PA on March 19th. They were incredible live! I have been saying all along KOPEK are going to be HUGE! It’s great to hear that you truly enjoy this band. Isn’t their album unreal great or what? COLD were excellent as well… whoa, they are legends. Egypt Central, Oceans Divide and Maddam Ink. were the other bands I saw the same night.